Classes are finally in session at Professor Dave's iRobot iNstitute. It's not too late to use your new education to submit an idea for a build to Instructables' iRobot contest: you could win $5,000! Hurry though, because if you don't already have a Create kit, Instructable is only taking "scholarship" concept entries until June 30. Regular contest entries are being accepted until August 31, so there's still plenty of time to apply your knowledge. Be sure to come back next week for Lesson 2. Oh, and see the bottom of this post for a great video sidebar, in which Professor Dave reveals his robotic mad scientist side!—Eds. The iRobot Create kit feature a special interface that enables users to control the robot’s behavior and locomotion as well as monitor its sensors. 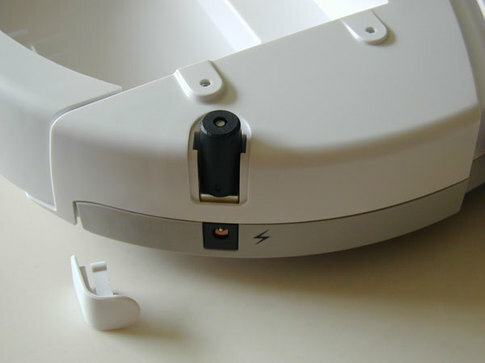 This interface is the iRobot Create Open Interface (OI). By using the OI, users can modify the functionality of a normal Create and build a new set of operating instructions—but without a brain, the Create’s interface is largely useless. So in this first tutorial, we’re going to show you how to get your Create thinking on its feet with a third-party microcontroller. ...then send the string and watch the action. While achieving successful results with this hard method are possible, it does require keeping Create tethered to a PC. Doable, but yuck. And who’s got a DB-9 serial port these days anyway? In the easy method, users can simply add an onboard brain. iRobot provides a controller called the Command Module, but many third-party controllers will also work and can provide different feature sets—here we’re using a chip called the Mind Control. 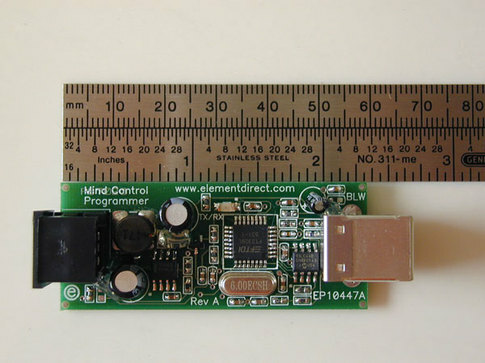 Manufactured by Element Products, the Mind Control consists of an elegant lipstick-sized, removable mini-DIN controller module that plugs into the Create’s serial port and a special Mind Control programming board. Just plug this programming board into your computer's USB port, write your program in a C or C++ programming language environment, send your program to the Mind Control module, plug the module into the Create serial port, and run your program. That's it. There's no tether and no command structures to master. You do, however, have to be familiar with C++ programming, but if you’re game enough to program a robot, you can probably handle some basic C code with the help of a good beginner’s guide (like this free WikiBook). Using Mind Control with a Create is the surest method for building an autonomous, programmable robot that can also scoot under your bed and hide from the cat. Or follow walls. Or whistle a tune. The possibilities are endless—check Element’s Mind Control page for some example programs to get started with (most are written with the Roomba—Create’s vacuuming cousin—in mind, but should be portable to the Create with some mild tweaking). NOTE: If you're thinking about building your own OI-to-PC control circuit, please note that the RXD, TXD, and Device Detect pins use 0 – 5V logic. Therefore, you will need to employ some sort of level shifter (e.g., RS232 Shifter; Spark Fun Electronics #PRT-00449; $13.95;) for enabling the Create to communicate with a PC using RS-232 serial communication voltage levels. There are four modes of operation for the Create OI: off, passive, safe, and full. OK, "off" mode is pretty easy to figure out; no power and the OI is off. Ta-dah. When in the off mode, the OI waits for the Start command. If the Start command is received, the Create enters passive mode. NOTE: Users cannot control any of Create’s actuators when in passive mode. NOTE: If any of these safe mode conditions occurs, Create will stop and enter passive mode. Finally, if Create is in safe mode, you can enter full mode by sending the Full command. Full mode disables the two detection conditions of the safe mode while terminating the powered charger condition. On the other hand, full mode enables unrestricted control of Create's actuators. NOTE: In order to return to safe mode, just send the Safe command to the OI. Additionally, a 20ms pause must be issued between all mode changing commands. If you're looking for the easiest, least painful method for controlling Create, then look no further than Mind Control. Mind Control lets you take control of Create through conventional C or C++ programming. Furthermore, Mind Control comes with everything that you need for making your Create, well, your Create. 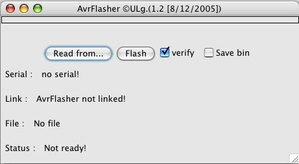 While the "official" statement from Element Products states that the Atmel ATmega168 microcontroller inside Mind Control should be programmed with the Atmel WinAVR programming tool on a Windows XP PC, there is an option for Create users who wish to use Mac OS X.
AvrFlasher by Henri-Pierre Garnir is a Mac OS X application originally developed for programming the AVR Butterfly board, but it can be applied to other AVR microcontrollers, as well. NOTE: This code is a snippet from a Mind Control program that was provided by Element Products. Yes, the operation and functionality of Mind Control is similar to that of the iRobot Command Module. Just like Mind Control, you write programs for Create in C or C++, then use the Command Module for downloading programs into an Atmel AVR ATMega168 microcontroller for subsequent execution. Likewise, the preferred platform is a Windows XP computer and the suggested programming environment is the WinAVR development tool. 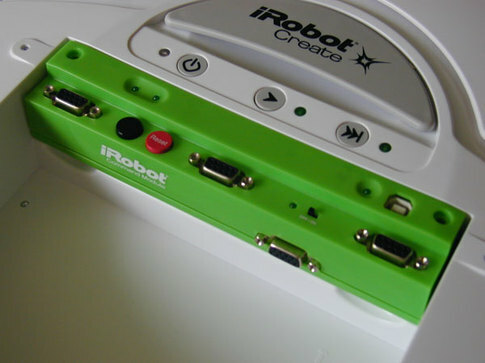 Unlike Mind Control, however, the iRobot Command Module plugs into the Create Cargo Bay Connector rather than using the Create serial port. Conversely, there’s also the matter of those four gorgeous expansion ports for adding additional hardware (i.e., ePorts) that bless the Command Module. On the other hand, Mind Control allows you to add Bluetooth communication to your Create with the Bluetooth Adapter Module (BAM; see Tutorial 2 coming soon!). Like the Command Module, BAM plugs into the Cargo Bay Connector. Therefore, BAM cannot be used simultaneously with the Command Module. So which AVR controller platform is right for you? Well, with only a ten dollar separation in price, select the controller that is best for your application. In other words, if you don’t need multiple analog and digital I/O lines, but you want to add Bluetooth communications to your Create, then try Mind Control. If you seek greater flexibility in hardware expansion, then the Command Module might be the best choice. How do I get a Create Kit?